ISCA’s mission is to create a healthier and enduring planet by providing revolutionary pest management solutions that are economical, effective and ecologically friendly. Since 1996, ISCA has been a world leader in developing environmentally-friendly pest control solutions with the goal of protecting our crops and protecting our planet. While some believe crop protection and environmental protection are mutually exclusive ideas, at ISCA, we insist they should go hand-in-hand. We purposefully design integrated pest management solutions that have minimal impact on the environment and a positive impact on public health and safety. As consumers grow increasingly concerned about pesticides in their food and the environment, crop owners and distributors must be prepared to provide safer, non-toxic products. ISCA meets this growing demand with environmentally-friendly pest control products for agriculture that eliminate or greatly reduce the need for insecticides—making them the safest solutions available. Dr. Agenor Mafra-Neto is one of the world’s leading researchers and entrepreneurs in the entomological field of insect chemical ecology and integrated pest management. He specializes in developing tools and solutions using natural chemicals (called “semiochemicals”) to manipulate the behavior of insect pests and vectors of disease with the goal of safer products for use in agriculture, forestry and urban environments. 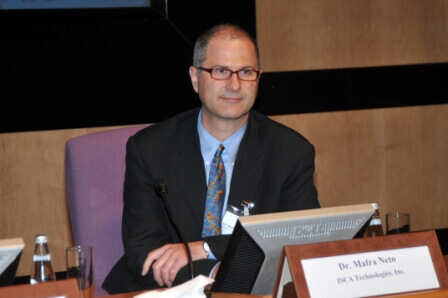 Dr. Mafra-Neto’s passion for food safety was born after he lost a close friend to toxic pesticide consumption. After this tragic incident, he realized how serious the threat of pesticides were and became committed to protecting our agricultural crops with greener solutions that were safer for humans and for the environment. ISCA is the catalyst accelerating the world’s transition to sustainable insect management. ISCA creates innovative semiochemical products that are extremely safe, efficient, easy to use and affordable, allowing growers to increase their profit and drastically reduce their environmental footprint. This is great news for growers, consumers, and the planet. As the founder of ISCA Technologies and an innovator in the field, he led the design and creation of numerous commercial pest management technologies, products and solutions; many patent protected. Dr. Mafra-Neto leads the global ISCA team that is focused on integrated pest management for the planet that is effective, economical and ecologically-friendly.